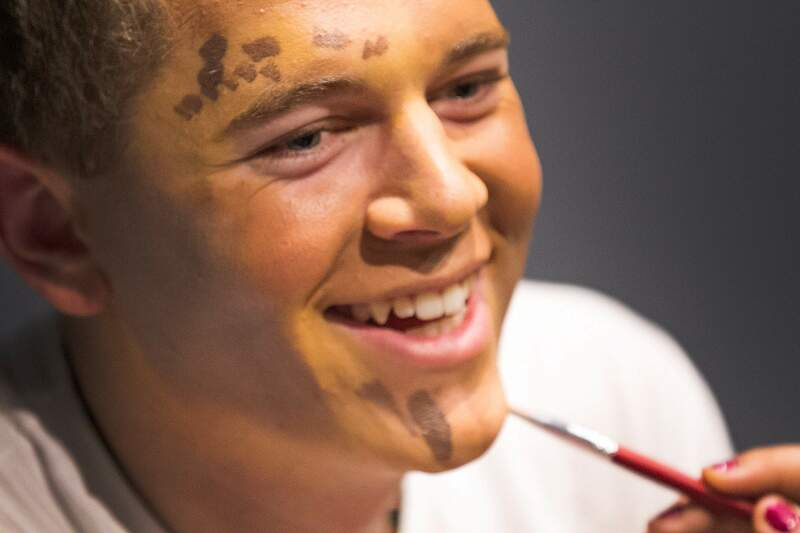 Durango High School junior Curtis Salinger has makeup applied as he prepares to rehearse the character of the Beast in the school’s performance of “Beauty and the Beast” in November. Salinger is in New York this weekend to perform in a tribute to legendary Broadway producer Jimmy Nederlander, and DHS Thespian Troupe 1096 is holding a gala Thursday to raise money for 17 troupe members to go to the national thespian competition this summer. Theater at Durango High School has been one of the hottest tickets in town for years because of the quality of the performances Thespian Troupe 1096 produces. There’s so much going on with the troupe, I hardly know where to start. Seventeen students qualified at the state level in December to compete at the national thespian awards, and the troupe needs to raise $20,000 to get them there. Their first major fundraising effort will be a benefit Gala dinner to be held at 7 p.m. Thursday in a decked-out cafeteria, with food by Mutu’s Italian Kitchen. The evening will be the only chance for locals to check out the contenders’ audition pieces and technical portfolios before they go. Tickets are $50 per person or a table for 10 for $350, and are available by emailing drama teacher and troupe adviser Benjamin Mattson at BMattson@durango.k12.co.us. It would be great if you could get those emails in by Monday morning, so they can give a head count to Mutu’s. Can’t make it to the Gala? Donations will be gratefully accepted. Make them to Thespian Troupe 1096, and mail them c/o Durango High School, 2390 Main Ave., Durango, CO 81301. In the meantime, one Troupe 1096 member, who will be president next year, is headed to the Big Apple this weekend for one of Broadway’s biggest occasions of the year. Over the last two years, the school’s fall musical – “Les Misérables” in 2014 and “Legally Blonde” in 2015 – have scored big at the Colorado Bobby G Awards for High School Musical Theater, with, among other awards, two members of the same family, Evatt and Curtis Salinger, winning Best Leading Actor in a High School Musical in Colorado. In 2016, one of Broadway’s most prolific and influential producers, Jimmy Nederlander Sr., died at the age of 94. All of the former Jimmy Awards participants – the national high school musical awards – have been invited to participate in the tribute to him Monday. Curtis’ parents, Peter Salinger and Sally Zabriskie, decided this is an event not to be missed, with six decades of Broadway stars expected to attend and/or perform. Ben Platt, the star of the Broadway musical “Dear Evan Hansen” and the “Pitch Perfect” movies, will be the master of ceremonies, so that should add to the fun. Evatt Salinger, who is a sophomore at Pepperdine University in Malibu, California, had a show called “Interference” premiering Friday, so he can’t make it, but there’s a story there I will pick up when I hear back from Curtis upon his return about all his close encounters of a famous kind. Here’s wishing Curtis the best possible “leg break” on this adventure.